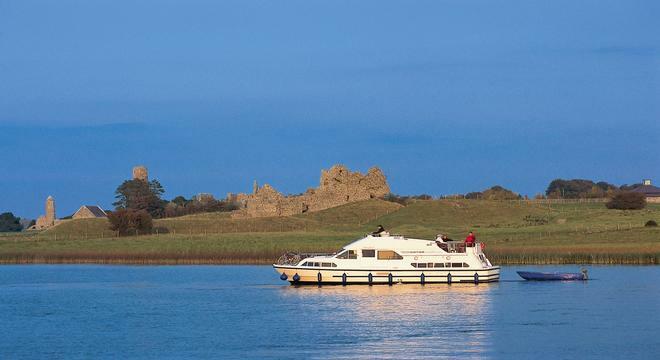 It won't be just the love that has you floating in paradise with this meandering cruise along the River Shannon. This is a unique Ireland Honeymoon that sees you navigate Ireland's longest waterway in a cruise boat. A shuttle bus will await you at Dublin airport, and after a pleasant drive through the rolling Irish midlands you will arrive at your marina in either Portumna or Carrick-on-Shannon. After a personal training session you are your own captain on board - the boats are so easy to handle that no licence is required and many of our guests are "first timers". Cruising at five miles an hour, your time is your own as you glide along, settling into an altogether peaceful way of life - you will soon find yourself totally relaxed and refreshed. The River Shannon itself is the most extensive inland waterway in Ireland and Britain which is shrouded in legends, myths and the gentle mists of time. You have the choice to avail of the wide variety of activities available in the area: scenic trail rides and lakeshore treks, championship golf courses, rich fishing in the Shannon, or unequalled bird watching. After a few days out on deck, enjoying the tranquillity and unhurried pace of life on the River Shannon, you can look forward to staying at the popular Hodson Bay Hotel, with its own private hotel pier. Your superior honeymoon room will overlook Lough Ree, its islands and the green Irish countryside. After a romantic dinner at the award-winning L'Escale Restaurant, the Waterfront Bar is the ideal place to relax with a pint of fresh Guinness. After a memorable seven days on the water your shuttle bus will return you Dublin airport, from where it is only a short taxi ride into the city centre of Dublin where you will spend your last night at the Maldron Hotel Smithfield in the heart of the city. Take a trip skyward in the glass lift the top of The Chimney Viewing Tower. The existing 185 ft old Chimney has been topped with a two tiered glass enclosed viewing platform, and provides a 360 degree panoramic view of the city. The Jameson Brewery is next door to the hotel, and the Guinness storehouse is one of Dublin's main tourist attractions. To explore Dublin's nightlife, Temple Bar is the place to go. Dublin's cultural centre, the area harbours many small clubs, cafes, galleries and museums. Prices are per person based on 2 persons in each room with full Irish breakfast and taxes included. A single supplement will apply to rooms and car rental in the case of single occupancy. Please note that we charge in Euros (€). Prices in other currencies are for indication only and subject to fluctuation.